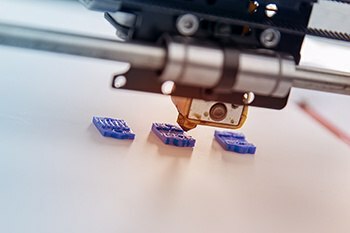 Companies can Print Your Own Parts for Design, Prototype, and Production. With today's technology, you can capture something from your imagination with software and then literally print your imagination. And while 3D printing can be used for fun, we focus on the more creative and practical realities and uses of 3D printers. 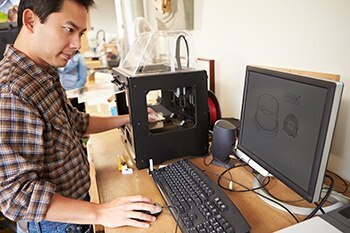 The ability to print 3D objects and designs in-house can help with innovation and transforming manufacturing processes to become more efficient. Choosing the right 3D printer isn't easy. There are a range of sizes and capabilities. Is fused deposition the right method? Or will selective laser sintering (SLS) or stereolithography better suit? We guide our customers to the right 3D printer for their needs. Whether you need plastic or metal models, we have the right device for you. We start by focusing on what you need – are you printing concepts, prototypes, or production parts? From there, we help you find the right device. Concept Models: Turn your design concepts into reality. Compare multiple concepts simply and easily to evaluate what works best. Verification Models: Once you have your design, print a few models to verify that the design will work in the real world. Pre-Production Models: Similar in quality to final units and useful for final testing and evaluation before moving to a production unit. Speed isn't always important, but you need to understand that different makes and models have different speeds – and that speed isn't just a mechanical function. File to finish speed includes build preparation, the 3D printer print speed, post-processing time, and finishing time (if needed). What's included in the quote for the cost to print a part? It varies from manufacturer to manufacturer and makes it difficult to have an apples to apples comparison. You want parts that are accurate on the first print, not the second or third. As parts increase in complexity, will the printer be able to output the part accurately? Can the 3D printer you're considering print the parts you need? What is the application you're looking to print? Will this be for prototype or production purposes? What type of material is needed? Will this be monochrome or full color? What are the dimensions? Can this be printed in parts as well? Ask for a benchmark print before buying. Learn more by reading 6 Questions You Need to Ask When Buying a 3D Printer. You don't just buy a 3D printer when you choose AIS. 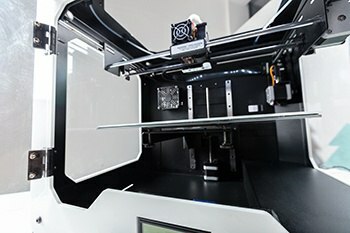 We walk you through every step of the purchase (beginning with are you looking for a printer in the design, prototype, or production phases) so that the 3D printer is the right one for you. We ensure that your equipment is capable of printing the application you want to print. After the sale, we don't just disappear. We're here to support you. Our in-house technicians can answer many service calls within hours. We also have most of the 3D printers we sell in our demo room. If you have issues, we can help troubleshoot and sometimes even help with printing the part for you. Contact our offices today to schedule a meeting with our staff.